Hello, I'm traveling to the Charlotte area to inspect an RV-7 I'd like to buy next weekend, Sept. 7-9. I need an A&P that can provide a thorough inspection onsite. He or she must also be familiar with these RV beasts to know what warrants extra attention to include build quality, log book red flags, etc. Must be willing to pull panels, cowlings, etc. Will compensate at a competitive rate for time and travel. 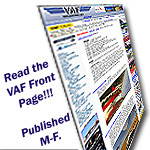 Steve, welcome to VAF----congrats on the upcoming purchase. Thank you Mike! I emailed him. Credentials are off the charts! I hired Vic to do two pre buys for me. Cannot recommend him strongly enough. If you can be there when he does the inspection you will be amazed at how much you will learn in the process. Good advice! I have already made the itinerary. I'll be all ears! Need a pre-buy A&P in the Escondido area for an RV-7 purchase.